It is finally upon us, after what feels like being announced forever ago, the brand new jumping on point for the Amazing Spider-Man with a brand new creative team is here. My excitement was tempered a bit after reading the FCBD issue in May but I'm still open to trying the first arc to see what the real thing is really like from here with Spencer & Ottley. So lets not waste any more time and just get into this bad boy because there's quite a bit to dig into. Nick Spencer starts the issue off by grabbing most Spider-Man fans by the heartstrings with a nice moment between Mary Jane and Peter/Spider-Man. It's revealed to be a dream, for now, with Peter awoken from his slumber by his roommate loudly playing video games, Call of Duty: Latveria, to the wee hours of the morning, forcing everyone to get an early start on his day. The story is off and running from there, and is cram packed with the side characters in Peter's life, in this over-sized issue. For the most part we run through a day in the life of Peter Parker & Spidey, with the 'Parker Luck' following him around like the plague, as everything he touches turns to crap. At a convention all his degrees are proven to be earned fraudulently, it becomes public news, he loses his job, even Aunt May feels let down by the turn of events. Obviously Pete cant reveal whats really going on without giving up his identity so he's really stuck here. 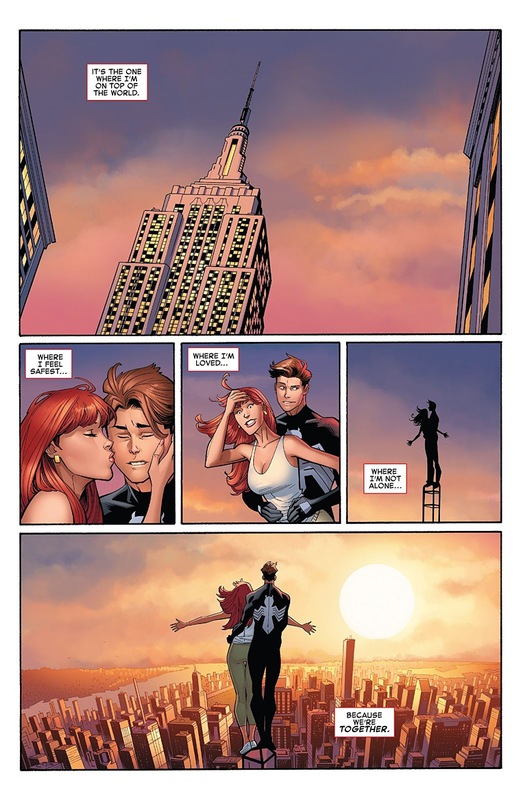 Its all sort of a 'fresh start' again for Peter/Spidey, even though that sort of just happened again in 'Legacy', but I can forgive it for now because of the strongly hinted reunion with Mary Jane on the horizon. , keeping everything else new enough for now. Even as Spider-Man this issue, the Avengers and company are giving him a tough go of it. They get on him a little more than usual it seems in a not so playful way, which is a little strange, and I'm not sure if we'll find out why. 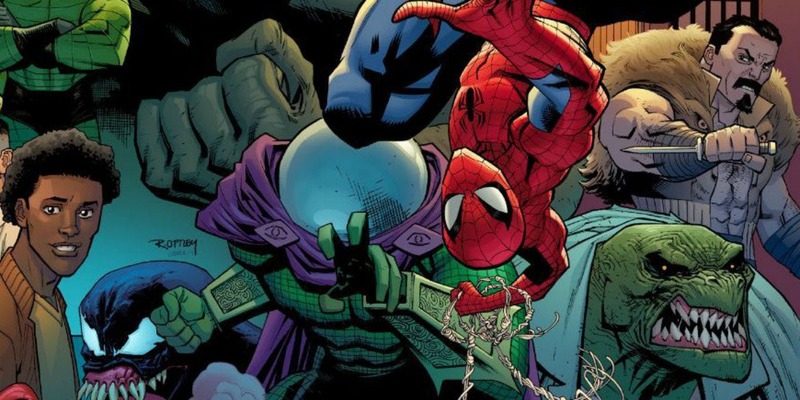 Among a herd of seemingly endless aliens, Spider-Man ends up taking a chance mid-fight on a hunch finding the first mystery villain of our issue, Mysterio, behind the latest shenanigans going down in New York. Spidey ends up putting an end to Mysterio's plans for now but scoots in embarrassment one of 'his villains' was responsible for such a scene. There's a pretty lengthy back up story in the issue as well, which isn't so Fresh Start friendly, and alludes to some future events coming up in Spider-Man issues. The first is scene featuring Mysterio in a court room after being caught by police post attack. He's sent a lawyer and begins having a vision of the second mystery villain becoming scared out of his wits dealing with the 'individual'. Even as a long time Spider-Man reader this is a tough spot for me as far as guesses go. Best guess I've seen say 'the Other' is the possible villain, which could be the lead in to the next Spider-Verse coming, but we'll have to wait and see. Part II of the backup seems like a teaser that leads into next issue in a pretty interesting way based on cover art it seems to line up. Overall, the newest #1 for Amazing Spider-Man, was a good jumping on point for new readers providing a decent run down of the main characters that will be involved in this run and where they currently stand with Pete. If your a long time reader of the series your mileage may vary with this issue but no doubt you have to be excited about a possible MJ and Pete reunion. Although I was confused with the timeline and how events played out at a few points in this issue, I liked what I read enough to still be intrigued for whats coming up in this book, and hope Spencer is able to get his groove back for Marvel post Secret Empire. 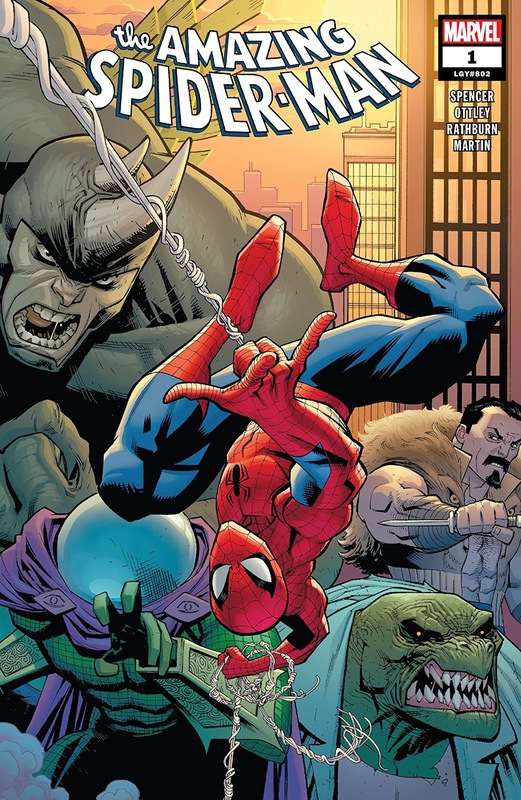 The art here with the new creative team is definitely a good match for this title when Spider-Man and the heroes are present. Sometimes when its just the human characters the faces look just a tad too cartoon like, as if I'm watching an episode of a Marvel show, for my personal liking but that is mostly a nitpick and something I'll get used to. As a whole I'm excited to see what this art team has in store for the future of this series. Amazing Spider-Man #1 provides a great jumping on point for new readers interested in the world of everyone's favorite web-head. If you're more of a seasoned reader that has stuck with this book some of what you read might feel a bit retreadish but necessary in a way to set the stage for whats to come. Regardless of where you stand you have to like the old relationships rekindled here. I'm interested to see where this goes for awhile. I re-read this issue again and I'm right in line with you Branden with the 7/10... I could push for a 7.5/10 because of Mary Jane. 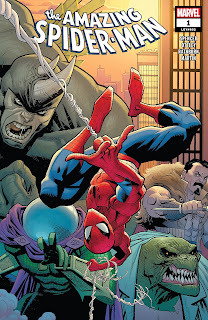 I'm still not a fan of Ottley's art, but he's usually an artist who is pretty good at staying on monthly schedule, so I'd like to see how the bi-weekly schedule works for him and if we'll be seeing fill in artists (or crossover issues) come in after the first arc or two. *ahem* Spider-Geddon *ahem*. Overall, I'm glad you're optimistic about the book because I know you weren't a fan of the FCBD issue. Well , one thing I notice is that the 2nd story had ottley and someone else inking and it was a little sloppy . At first i didn't think I liked the art but I got used to the style and I like it now . I like the writing and art a lot actually . It's not perfect but still more interesting than the usual fare . I think Spencer is a much better writer than Aaron for example . Yea, usually Ottley would ink for himself, but I'm sure he'll have to send it in for someone else to do it with the tight schedules. I'm indifferent about Spencer being the better writer. Spencer is definitely a better writer when it comes to dialogue among characters for sure. It just feels natural. No shade thrown at Slott, but Spencer's internal dialogue for Peter is pretty spot on with the character, especially if you're looking back at the JMS run. 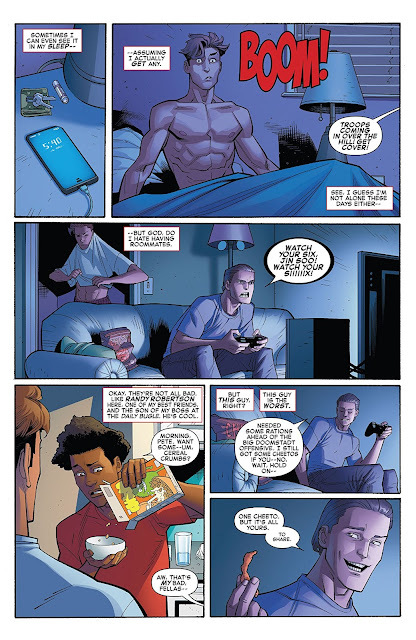 Slott's Peter just felt like he was too childish and aloof, instead of just a guy down on his luck (Parker luck), when things seem to be going right for him. Backup from what I can tell is done by Ramos from the looks and feel of it if you ask me although I dont see his name credited. I enjoyed this issue enough but its still wait and see for me, Spencer hasnt done anything Id call great in a long time, but Im optimistic this has potential. Yup, the backup was by Humberto Ramos. Editor Nick Lowe has it in the letters/credits page.